There are six elements of a triangle, which are; three angles and three sides. Median: The line segment which joins a vertex of a triangle to the mid-point of its opposite side is called the median of the triangle. A triangle has three medians. Altitude: A perpendicular line segment which joins a vertex and the opposite side is called the altitude of triangle. Each side of a triangle has its own altitude. Exterior Angle: The angle formed on a line which is extended outside the triangle is called the exterior angle. An exterior angle is equal to the sum of angles of interior opposite angles. In the given figure; Angle 3 is external angle. Angle Sum Property of Triangle: The sum of all the internal angles of a triangle is 180°. In the given figure; ABC is a triangle with ∠1, ∠2 and ∠3. Let us draw a line segment PQ which passes through the vertex A and is parallel to BC. The straight angle on this line can be divided into three angles ∠1, ∠4 and ∠5. Let us now try to prove that sum of internal angles of a triangle is 180°. In other words, it is proved that sum of internal angles of a triangle is 180°. Equilateral Triangle: When all sides of a triangle are equal, it is called an equilateral triangle. Each angle of an equilateral triangle is equal to 60°. Isosceles Triangle: When any two sides of a triangle are equal, it is called an isosceles triangle. Angles opposite to equal sides are always equal. Scalene Triangle: When each side of a triangle has a different length, the triangle is called scalene triangle. Acute Angle Triangle: When all the angles of a triangle are acute angles, the triangle is called acute angle triangle. Obtuse Angle Triangle: When one of the angles of a triangle is an obtuse angle, the triangle is called an obtuse angle. Right Angled Triangle: When one of the angles of a triangle is a right angle, the triangle is called a right angle triangle. In a right angle triangle, the longest side is opposite to the right angle and is called the hypotenuse. The remaining two sides are called the legs of the triangle. They are also known as perpendicular (p) and base (b). It is important to remember that any of the two can be called a perpendicular or base. Question 1: In ΔPQR, D is the mid-point of QR. (a)	In ΔABC, AD is a median. 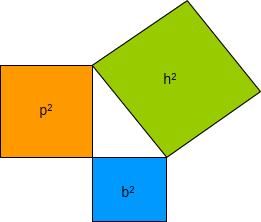 (b)	In ΔPQR, PQ and QR are altitudes of the triangle. (c)	In ΔPQR, RS is an altitude in the exterior of the triangle. Question 3: Verify by drawing a diagram if the median and altitude of an isosceles triangle can be same. Answer: Do it yourself; by looking at any of the diagrams of isosceles triangle in this lesson.